SAN JOSE, CA--(Marketwire - Sep 12, 2012) - Brocade Analyst and Technology Day -- Brocade (NASDAQ: BRCD), the industry leader in fabric networking, today announced a revolutionary switching platform, the Brocade® VDX® 8770 Switch, along with VCS® Fabric technology enhancements that take data center network simplicity, efficiency and resiliency to a new scale. The Brocade VDX 8770 is designed for enterprises and service providers striving to both simplify and scale-out their data center infrastructure in order to accelerate new service introduction and drive innovation, while also lowering costs. With more than 700 customers who have already installed Brocade VDX switches, Brocade is building on the success of its VCS fabric-enabled switch portfolio with the addition of the modular Brocade VDX 8770 Switch. The newest family member is built to support the largest data centers, delivering unprecedented simplicity and automation along with massive scalability and performance -- all while offering superior investment protection. The Brocade VDX 8770 and VCS Fabric technology deliver a radically simplified data center network. Designed specifically for highly virtualized environments, Ethernet fabrics built on VCS Fabric technology accelerate application deployment and enable faster virtual machine (VM) migrations through zero-touch VM discovery, VM mobility and VM port configuration migration. Using VCS fabrics, customers can manage dozens of switches as a single logical device, dramatically reducing operational costs. They can also save installation time as new switches self-provision when they are connected to the fabric. With today's virtualized and cloud-centric data center architectures, application performance is highly dependent on the efficiency and utilization of the network infrastructure. VM density per server is also rapidly increasing as customers seek to maximize server utilization. To support these requirements, they need a high-performance network that can scale out on demand to address immediate business needs. The Brocade VDX 8770 provides unprecedented fabric scalability for the world's largest data center environments, enabling customers to expand a single VCS fabric up to 8000 switch ports with up to 384,000 VMs attached to the fabric -- 20 times the scalability of the leading competitor. Designed for today's real-time applications, the Brocade VDX 8770 also delivers the industry's lowest port-to-port latency at 3.5 microseconds across all 1 Gigabit Ethernet (GbE), 10 GbE and 40 GbE ports -- half the latency of the nearest competitor. Moreover, the Brocade VDX 8770 sets a new standard for network efficiency and fault-tolerance with improved scalability and load balancing of Layer 3 gateways in the fabric. Combining this Layer 3 innovation with VCS fabric trunking and TRILL-based Layer 2 ECMP, customers can realize significantly improved network resiliency and superior application performance by maximizing available network bandwidth. The Brocade VDX 8770 is specifically built to address the evolving needs of tomorrow's data centers and to support the latest technologies. With an industry-leading 4 Tbps backplane, the Brocade VDX 8770 chassis is designed to support future technologies such as dense 100 GbE, providing ample performance capacity for years to come. The Brocade VDX 8770 is also engineered for emerging Software-Defined Networking (SDN) architectures, with flexible hardware support for network virtualization through technologies such as VXLAN overlay networking. In 2010, Brocade began articulating a vision for transforming networking to support the next-generation cloud-optimized data center. Later that year, Brocade delivered on the first phase of this vision by pioneering the Ethernet fabric category with the introduction of Brocade VCS Fabric technology and the Brocade VDX 6720 VCS-enabled switch. 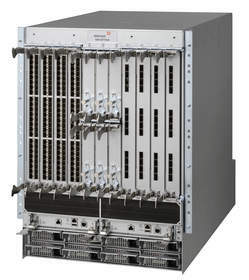 In 2011, Brocade delivered on the second phase of its vision by expanding the Brocade VDX family with the Brocade VDX 6710 and 6730 switches. Continuing the revolution of the data center networking and Ethernet fabric category, the introduction of the Brocade VDX 8770 represents the third phase of Brocade's vision. This vision focuses on helping the largest-scale data centers utilize VCS fabrics that deliver superior automation, resiliency and efficiency to support the most advanced private and public cloud environments. The Brocade VDX 8770 is orderable now. U.S. list price starts at $65,000 ($833/10G port). The Brocade VDX 8770 and other Brocade networking solutions are available direct, through Brocade channel partners and via Brocade Network Subscription. "Ethernet Fabrics are the key technology component of fabric-based infrastructures. As organizations seek to maximize efficiencies in the data center, enable greater agility, and optimize the user experience, they are moving to more scalable, flatter network topologies to drive higher performance and lower latency across the entire network. For Service Providers, fabrics create a more flexible architecture that allows a broad range of services to be delivered to a large customer set with diverse requirements. For enterprises, fabric architectures simplify network operations and support virtualization by breaking the physical ties between application servers and the network topology," said Mark Fabbi, vice president, distinguished analyst, Gartner. "The Brocade VDX 8770, VCS enabled switches, with full bandwidth fabric and multipath capabilities, provide our customers with significant availability, efficiency and scalability benefits," said Sujal Patel, president, Isilon Storage Division, EMC. "IBM and Brocade are focused on providing our joint customers with the best networking solutions possible, which is why we're so pleased with our continuously growing partnership with Brocade. Brocade VDX switches leverage IBM's InfoSphere BigInsights Hadoop-based product, and IBM InfoSphere Streams is leveraged in the wider, integrated solution. Since the Brocade VDX switches are optimized for the IBM Big Data platform, they are an excellent solution for companies that need to manage large quantities of mission-critical data," said Nagui Halim, IBM Fellow, IBM. "Windows Server 2012 provides Microsoft customers with industry-leading innovation in software-defined networking, which enables advanced network virtualization for private, public and hybrid cloud environments. We are pleased to work with Brocade and its VCS Fabric as part of our large Windows Server Hyper-V ecosystem. Together, we can help organizations deploy flexible, automated networking for the multi-tenant cloud," said Ross Ortega, principal program manager, Windows Networking, Microsoft. "We are pleased to continue to partner with Brocade to enable our joint customers to realize the benefits of Brocade's networking technologies, coupled with secure, flexible and trusted VMware cloud infrastructure, including the new VMware vCloud® Suite. Together, we are helping our customers accelerate their journey to the cloud, while giving them the resources they need to embrace software-defined networking," said Parag Patel, vice president, Global Strategic Alliances, VMware. "After evaluating the Brocade VDX 8770 Switch as part of an early field trial program, we are extremely satisfied with its performance and scale. We are a growing business, and we need a network that can grow as we do. I look forward to streamlining our network with the addition of the new switch," said Tomohiro Ueno, network team leader, CyberAgent, Inc.
"I see Ethernet fabrics as the biggest innovation in the service provider market. We've been using Brocade VCS Fabric technology for two years now and we believe that it is the best fabric solution available. The tremendous throughput, flexibility, and stability of Brocade VCS fabrics have allowed us to expand our services greatly, while exceeding customer expectations. We have been using the Brocade VDX 8770 Switch, and it builds on the steps made by the Brocade VDX 6720 platform we adopted in 2010. It gives us the agility and simplicity we need to scale out our network even further," said Stefan Ideler, CTO, Interactive 3D. "We are a 4500-seat enterprise with two data centers and over 80 microsites -- mostly national but some international. The combination of performance, manageability and value offered by the Brocade VDX family is unmatched by any other switch vendor. The Brocade VDX 8770 Switch, in particular, fits for us very well due to the port density, power, and manageability. Our data center network used to be a big bottleneck for performance and I foresee that the Brocade VDX 8770 will allow us to grow and keep ahead of the network demand curve, especially for east-west data center traffic, which continues to grow with no end in sight," said Michael Harrison, senior network engineer, Physicians Sales and Service. The Brocade VDX 8770 is designed for enterprises and service providers striving to both simplify and scale-out their data center infrastructure in order to accelerate new service introduction and drive innovation, while also lowering costs.